...as the first of what we hope to be many Hungry Fan Throwdowns with NASCAR fans going forward. Indeed, we learned a lot. And the event, which can be watched via Facebook Live here, was fantastic!! With the incredible help and support of the Pocono Raceway and NASCAR, we had about 1,000 NASCAR fans in attendance and we were lucky enough to be joined by 4 great coaches--Dale Earnhardt Jr., Ryan Blaney (who won the Pennsylvania 400 at Pocono a couple months before), Martin Truex Jr. (who won the following week at Watkins Glen), and Landon Cassill. These four guys coached two stellar teams--one composed of some lovely, culinarily-minded locals to the Pocono area and another made up of some very spirited Canadians visiting from Toronto and Ottawa. 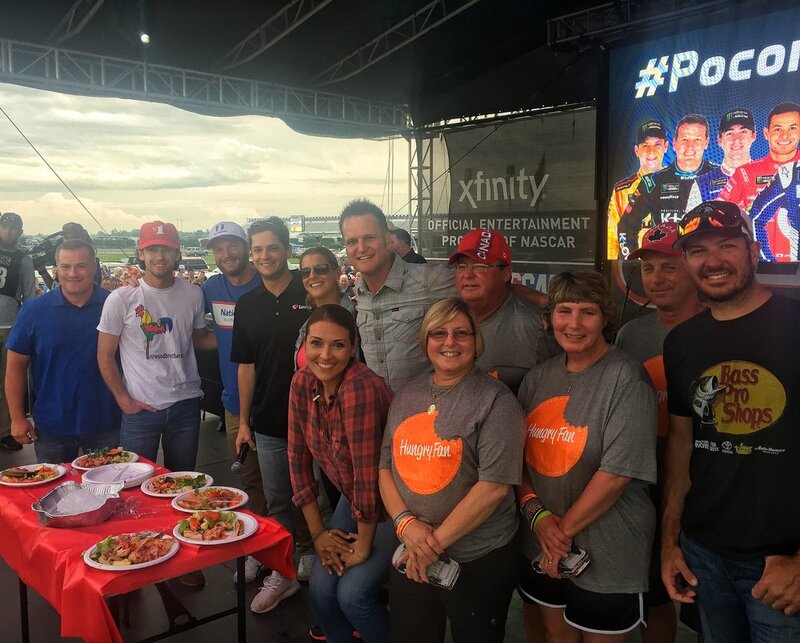 In the days leading up to the event, I was most looking forward to seeing how NASCAR fans would respond to being randomly picked from the infield to participate in a mystery cooking event. (Cooking...at a NASCAR race?) The plan was to only tell them the event had to do with food and barbecuing. I was then eager to see how they'd react when they found out they'd be cooking on stage in front of 1,000 of their peers with the help of their favorite NASCAR drivers. As former TV show producer, I couldn't help but yearn for that "reveal" moment and to see their faces when the drivers came onstage. Cut to the day of the Fan Fest and Hungry Fan Throwdown--Friday, July 28th. Shortly after the heavens opened and dumped an impressive amount of rain onto the Poconos--the raceway included--we set out with a member of the Raceway staff (he knows who he is and he is awesome) into the infield to find our Throwdown teams. I didn't really know what to expect, especially given the weather. Everything was pretty sodden and I was worried the rain might keep people inside or dampen the general conviviality that you find in a NASCAR infield in the days leading up the race. Fairly quickly into our campground trip, we spotted a truly magnificent tailgating setup. Three RVs were parked in a U-shape, forming a courtyard, if you will. Stretched across the entire courtyard were a series of grills--perhaps 5 in total--all different, complete with different surfaces and cooking tools. I was impressed. We had to stop. What followed was something I was not expecting but it's a story I had to share because every fan has a story. And this fan's story grabbed at my heart and made me appreciate her participation in our event that much more. There was no one to be found that rainy afternoon when we rolled up to this impressive RV and grill situation. So we knocked on the door of one of the RVs, hoping to identify the person responsible for all the grills and the deliciousness that undoubtedly was being cooked up on them. Michelle (second from the left) is pictured with her teammate, Jan, as they prepare to go onstage for The Hungry Fan Throwdown. Michelle Duchnik, a Lackawanna County, Pennsylvania local, answered the door. I asked Michelle what was going through her mind when she saw us standing there. She said, "I didn't see you pull up to the camper. We were inside and actually I was napping because of the rain. When I opened the door and was asked to come out I thought to myself, 'What did we do wrong?' I had no idea what was going on." We briefly explained why we had stopped (serious grill envy) and that we were searching for NASCAR fans who can cook and who would be interested in participating in our event. We were delighted when Michelle agreed. Michelle adds, "I didn't know what to expect--just that I have never accepted a challenge like this before and was a bit excited and honored." We were then joined by Michelle's husband, David Sr., and they told us a story that grabbed me (big time) emotionally. 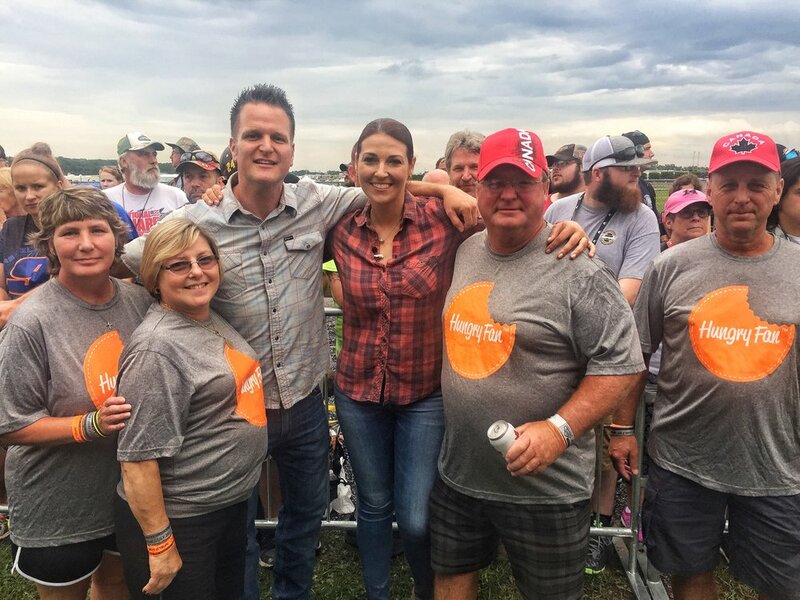 Michelle and her husband, while avid NASCAR fans and race attendees (they have traveled to not only the Pocono Raceway multiple times but also Dover, Bristol and Daytona), had a special reason for attending that weekend's race. The Duchniks had attended the same race last year with their son, David Duchnik Jr. A few short days after the race, David Jr., who worked for the family towing company, was cleaning up a crash on the side of Interstate 81 when a tractor trailer neglected to move over and instead collided with the crash scene, killing David Jr. It was just four days before his 29th birthday. The Duchniks were attending this year (days before David Jr. would have turned 30) to remember and celebrate the life of their son. Needless to say, we were touched. Michelle's husband David Sr. then went and grabbed a canvas banner for us to see. Printed on it was a photo they had taken of David Jr. at last year's race. He sat atop their RV, the race going on behind him. He was looking at the camera and was waving. One might say he was waving goodbye. The banner--the photo of him waving--made the hair on my arms stand up. What a story. So sad, so tragic. And what a family. Such resilience. And with all that tragedy, Michelle was still willing to get up on that stage and throw down. It's people like Michelle that inspire me. As I travel around the country attending events and mixing it up with fans, I am constantly struck by fans' stories. It seems everyone's got one--all equally compelling in one way or another. I'm so grateful Michelle and her husband David Sr. chose to share theirs with me. And I'm also grateful they allowed me to share it with you all. I asked Michelle what she thought of the Hungry Fan Throwdown, hoping that it in some small way, we had contributed to the happiness of a woman who I felt deserved a little extra happiness. Michelle replied, "I had a great time. NASCAR drivers don't do that much interaction with the fans like the NHRA drivers do. This is a great way to bring out the drivers and see a different side of them." That day in the infield, I asked Michelle who her favorite driver is and she replied Dale Jr. She said that she and her family have been Earnhardt fans for years. It's pretty cool then that he was able to join her up on that stage that evening. She noted to me after the race that our event "was a great experience and made the whole weekend special." On behalf of the Hungry Fan team and the Pocono Raceway, I think it's safe to say we are all so pleased to hear that. I felt it important to share what Michelle and her husband, David Sr., have been working on since the death of their son a year ago in the hopes that you might perhaps feel compelled to get involved or in the very least learn more. The two have been actively involved in raising awareness of the Slow Down Move Over Movement, which encourages drivers approaching stationary emergency vehicles displaying flashing lights, including tow trucks, to vacate the lane closest if safe and possible to do so and to slow to a speed that is safe and prudent. Recently, the governor of Pennsylvania signed into law stricter penalties for those in violation of the the now Slow Down Move Over Bill. Yet while the laws are now in place, inclusive of more severe penalties for those who disobey, Michelle and David Sr. are looking for people to help raise awareness to ensure Slow Down Move Over is enforced. You can join the Duchniks on September 23rd in their area for the Spirit Ride. The Spirit Ride began earlier this year in Las Vegas and features a decorated casket that is traveling from city to city. You can find more information on the Spirit Ride and how to join Michelle and David Sr. on the Spirit Ride Facebook Page or by visiting the American Towman Spirit Ride site.